Elizabeth Blackwell's "A Curious Herbal" (1751): 1. The stalk grows to be two foot high, ye leaves are a dark green, and ye flowers red. 2. It grows in Hedges, and on Banks, and flowers in June. 3. This plant is accounted by some a good vulnerary, and serviceable for all sorts of wounds, and putrid ulcers. It is esteemed restringent, and good to stop inward bleeding, and ye making of bloody water. 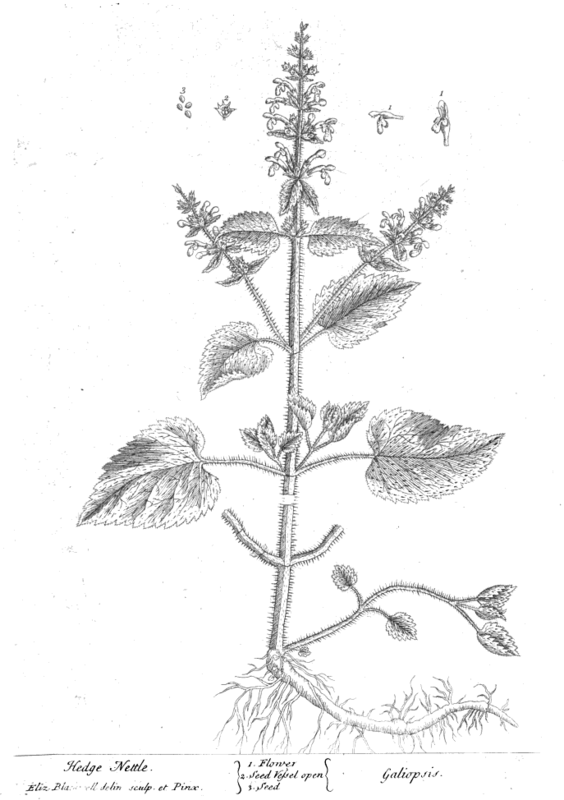 William Thomas Fernie - "Herbal Simples" (1895): [note - not sure yet if this is the same plant] The Hedge Woundwort was named by Gerard, Clown's all heal, or the Husbandman's Woundwort, because a countryman who had cut his hand to the bone with a scythe, healed the wound in seven days with this plant. 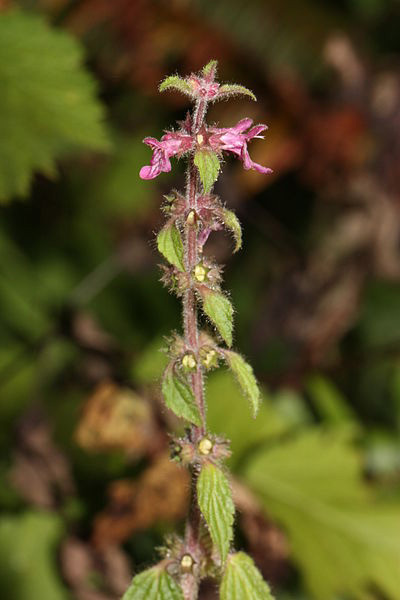 It is named by some the Hedge Dead Nettle, from its nettle-like leaves, and the place of its growth. "The leaves," says Gerard, "stampt (pounded) with hog's grease, and applied unto green wounds in the manner of a poultice, heal them in such short time and such absolute manner, that it is hard for any one that hath not had the experience thereof to believe. For instance, a deep and grievous wound in the breast with a dagger, and two others in the abdomen (or nether belly), so that the fat commonly named the caul, issued forth, the which mortal wounds, by God's permission, and the virtues of this herb, I perfectly cured within twenty days-for the which the name of God be praised." Edward Lee Greene - "Landmarks of botanical history" (1909): We observe that Dioscorides as long ago as the first century of our era segregated the dead nettle as a genus, and under a name which pointed to the character of its flower, the name Galeopsis; and this proposition had evidently been acceded to by some of the mediaeval Latin botanists, who, instead of the Greek, had employed such Latin equivalents as Urtica mortua, Urtica iners and Urtica labeo, the last a most significant appellation, "nettle with a lip," evidently taking cognizance of the floral character, while the other two refer merely to the lack of stinging hairs. Now this mediaeval synonymy of the plants is perfectly familiar to Brunsels. He formally quotes every item of it; and his approval of Galeopsis 1 as a proper genus comes out plainly enough, at least to the careful reader, and on this wise. In reproducing what Dioscorides had said about the labiate nettles he does it under the following caption: "De Galiopsi simili Urticis herba, Dioscorides." 2 Of such a caption the English version is, "Concerning Galiopsis of Dioscorides, an herb resembling the nettles." Of course, that which resembles another thing is not that other thing which it resembles; and nothing that was ever printed in a book is plainer than that this author did not regard Galiopsis as congeneric with Urtica. When in his Icones he sandwiches the dead nettle in between two real nettles, and when as a heading to his Chapter XXIII., in which both kinds are discussed, he places that simple "De Urticis," he is purposely adapting himself to the understanding of the half-taught root and herb dealers, and the untaught old women, who call them all nettles indiscriminately. In a word, Brunsels is a man of some learning and insight in matters botanical, and also a man of discreet conservatism; holding it unwise to lay too openly before the general public every advanced taxonomic view that is his own. In his indubitable though dissembled accepting of Galiopsis as distinct from the nettles he cannot but have been impressed by the fact that Dioscorides in making the segregation had done so in deference to its flowers, which he described as being "slender and purple"; and it may or may not have been in deference to similarity in floral structure that closely appended to the UrticaGaliopsis series comes an unbroken line of three other galeate flowered labiate types. If, however, this be an example of guidance by anthology to the recognition of affinity, still it is a guide which Brunsels is as far as possible from following steadily. The flowers of orchidaceons plants have as much agreement in character as have those of labiates; but when he comes to the grouping of what are known to us as the orchid genera we find that all those which have two or three large tuberiform roots are gathered into one place by themselves, 2 while their merely fibrous-rooted kindred form a group quite apart from these, 2 various wholly unrelated types intervening between the two orchid groups. This is all quite after the method of antiquity; the method of those who, heedless of flowers, to the knowledge of which they had not advanced, concluded things to be allied because they were alike as to roots, and, it may be, as to stem and foliage also. 1. In modern botany the genus is written Galeopsis. Dioscorides (Book X, ch. 80) wrote it Galiopsis. as did also Brunsels. Runkel, Sylvan T. and Dean M. Roosa. Wildflowers of the tallgrass prairie: The Upper Midwest. 2009. University of Iowa Press. British Medical Journal. Article: Letters and Answers. 14 March 1936. 1(565). Dr. Rita Louise. 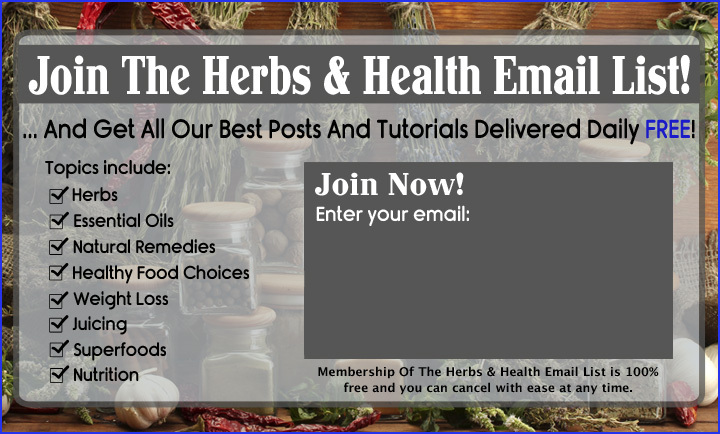 Herbal Actions Guide. http://www.soulhealer.com/herb%20actions.htm. In modern botany the genus is written Galeopsis. Dioscorides (Book X, ch. 80) wrote it Galiopsis. as did also Brunsels.